There are, of course, progressive instructors who are not willing to accept mediocrity. They have created challenging courses of fire which take shooters out of their comfort zone, requiring a fast and accurate response to a simulated threat. Compressed time frames, poor light, multiple threats, movement, as well as realistic targets, are incorporated into their training scenarios. Most of us can appreciate the fact that training officers to become better gun handlers and shooters enhances their chance of meeting with success in a deadly confrontation. But, do targets really matter? Absolutely! Any tool which makes a trainee push just a little harder to achieve success is a plus in my book. Compared to other technologies, targets made of paper or steel are a real bargain. Combined with a little creative thinking, well designed targets help reinforce good shooting tactics. 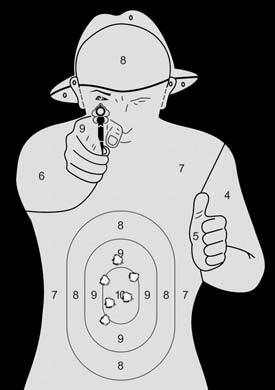 The first targets utilized for law enforcement firearms training were simple bull’s-eye. This style of target was used almost exclusively for what little firearms training was offered in the early part of the 20th century and remained in wide use for years. In the l930s, more realistic courses of fire were developed, along with the first “humanoid” targets. The most popular evolved into the classic B-21 which is widely utilized today. This target consists of a large, full-size silhouette with valued scoring areas. For example, a hit in the chest would have a value of five points, while one in the left arm would score only two points. As an interesting footnote, the B-21 also features “D” values, where a hit in the right arm might disable an assailant. This thought process is a holdover from an earlier era of time and is no longer consistent with contemporary law on the use of deadly force. For any number of reasons, the classic B-21 has fallen from favor. Its very large K5 scoring area gives the shooter the same point value for a hit to the low abdomen as to one in the center chest. Should you pull a shot left one foot and miss center mass, you still may get lucky and scratch out three points with a hit in the right arm. In its day, the B-21 was cutting edge, but far better designs for training and qualification have come along. Back in the l960s, the NYPD Firearms Training Unit introduced the innovative “thug” target. Rather than a black silhouette, this target featured the drawn image of a man pointing a gun, a not so subtle reminder of why the officer is justified to fire. The B-60 “thug” target bears the facial image of NYPD Lt. Jesse Oldshien who holds the distinction of being the “most shot at cop in history,” as this target has been in use since the 1960s. While not perfect, the B-60 served as the springboard for even better pictorial targets which denote both shoot and don’t shoot situations. Today, there are hundreds of different styles of targets available for police training and qualification. Targets commonly utilized for marksmanship assessment and qualification include classics such as the B-21 and B-27, the Transtar II and the FBI “Q.” Dozens of variations – relative to size, color and high value hit zones – exist for all the aforementioned targets. We can also draw on a huge assortment of pictorial targets which use either a sketched or photographic image. These targets could include hostile or non-hostile subjects, partially exposed subjects, or hostage situations. Conventional scoring rings may be incorporated into target design or even on an anatomy overlay which gives the shooter a greater insight as to what he (or she) is really hitting. Better paper targets also feature a realistic sized, high value incapacitation zone. Unlike the old school targets with their overly optimistic high value areas, the DST series from Law Enforcement Targets requires the shooter to fire with a degree of precision. These targets are designed as a progressive series and include a cardboard silhouette; a colored face with numerically valued hit zones; and various pictorial targets which might be bladed or positioned behind cover. All targets feature a Primary Neutralization Zone (PNZ) which becomes significantly harder to hit when the simulated threat is no longer square to the shooter or only partially exposed. This isn’t much different than real life. Many jurisdictions mandate a specific target for police qualification and my state is no exception. In our little part of the world, the FBI “Q” target is the standard which is both a good news/bad news proposition. Scoring is indeed a snap and any hit within the border counts full value. This, unfortunately, gives the shooter an inflated idea of marksmanship capabilities. Since its R2-D2 appearance lacks any human qualities, I’m not especially thrilled using the “Q” target for the complete training experience. To satisfy my own curiosity, I recently created a laminated target consisting of an FBI “‘Q” on top, followed by a B-21, Transtar II, and a B- 60. Caution was used to ensure that the high value zones of each target were lined up with the others as they were affixed to the backer. I then had a skilled shooter of my acquaintance run through a standard police qualification course which included firing at distances from one to 25 yards. Since I knew our test pilot could easily score a possible 100%, I had him shoot the entire drill left-handed and at double speed. This would yield a decent, but less than perfect, score to compare the different targets. While hardly conclusive, this little bit of weird science confirmed my suspicions. With an identical effort, the very forgiving “Q” target yields greater ballistic gratification. Hits which score full value in the “Q” may only be worth three or four points in the B-21 or Transtar II. Choose your targets carefully. Sure, you might have to work a bit harder to avoid bruising your ego and to achieve the same score, but the end result is worth it. Even the best paper or cardboard targets are only two-dimensional. To have officers gain a bet ter appreciation of delivering decisive hits on a threat which presents itself at angles, a 3D target might be included in the mix. If your budget allows, mannequins and self-sealing silhouettes are available from a variety of sources. Those of us among the fiscally challenged might make do with either polymer or cardboard torsos. By using a pair of cardboard targets, a couple of empty ammunition boxes and some tape, I have been able to create a basic 3-D torso. An old shirt and last year’s Halloween mask help complete the picture. Commercial 3-D torsos are available from Action Target. These targets can be folded together in very short order and balloons in the chest and head can provide instant visual feedback when scoring a good hit. I’ve always enjoyed some pretty fair success using plastic torso targets which have been mar keted under a variety of names. “Tactical Ted” consists of a hollow plastic shell which can withstand thousands of rounds of ballistic abuse before becoming unserviceable. Once again, these targets can be accessorized with a shirt, a hat and an old pair of pants, and can be used just about anywhere. To create a high value hit zone, I often suspend a roll of paper towels or toilet paper inside the shell of the target to reinforce proper point of aim on angled shots. Reactive targets provide the shooter with some form of positive feedback after delivering a well placed hit. Depending on the type of target utilized, feedback can be visual or audible. The most commonly utilized type of reactive target is made of steel. Steel targets can be fabricated in an almost infinite variety of shapes and I often use a mix of silhouettes, pepper poppers and head plates in my training. Only high quality steel targets from reputable manufacturers should be utilized. Care should also be exercised when setting up steel targets on the range, so that bullet fragments are directed down and not into the safety zone of another steel target. Always place steel targets on a safe surface, such as loose dirt or sand, to minimize splash back toward the firing line. Safety can be further enhanced by the use of frangible ammunition. Steel targets tend to be very useful in holding the attention of shooters and keeping them focused on the positive. When you hit, there is an instant reward in the way of a loud metallic clang or falling target. Shooters are less likely to dwell on negative aspects as recoil and I find steel targets indispensable for shotgun training. In real life, bad guys move. In view of that, it would certainly help the cause if we could incorporate some moving targets into our training. If the sky is the limit, remote controlled robotic targets which can move in any direction can be had. Commercial running targets which run off a cable or track are widely available, but I don’t consider them the best choice. Swingers which bob in and out of cover might be slightly more realistic, but we can still do much better. Several years ago, I was able to cobble together a moving target based on Louis Awerbuck’s innovative Mirage Target System. By using a combination of pipes, elbows, rods and springs, we created a target system with unpredictable movement. Shoot and don’t shoot targets can be placed in close proximity and our homemade mover is very challenging – even when firing from close range. No one style of target will meet all of your training needs. I recognize that one of the popular paper or cardboard designs will ultimately be selected for qualification and, in many cases, we don’t have a choice in what we use. But, in our training, we can afford to get a little more creative. Utilize targets with human qualities which require more effort to achieve decisive hits. This could include targets with smaller incapacitation zones which are partially hidden behind cover or are in close proximity to innocent bystanders. More cost-effective and street relevant training can be accomplished through dynamic training exercises requiring only four or five shots. Anything we can do to make the training experience more realistic is a step in the right direction. Targets which replicate the challenges officers face in an increasingly hostile operational environment should be part of every training program. About the Author: Captain Mike Boyle served with the New Jersey Division of Fish & Wildlife, Bureau of Law enforcement, and has been an active firearms instructor for more than 30 years. He has been an assistant police academy director and remains active as an academy rangemaster and instructor. Mike has served on the Board of Directors of the International Association of Law Enforcement Firearms Instructors (IALEFI) since 1996. He is the architect and coordinator of IALEFI’s Master Instructor Development Program.